We recommend three to six months of expenses set aside for an emergency fund. If you have six months’ worth sitting in the bank and you took it down to three, you’d probably be okay. But if you spend it down to $2,000 and move into a new house, you’re asking for trouble. We’d love for you to put down 20 percent because you’d avoid private mortgage insurance (PMI), which costs about $75 a month per $100,000 borrowed. It costs you a lot of money if you don’t put down 20 percent. You should try to do that, but don’t be irresponsible on the emergency fund side. 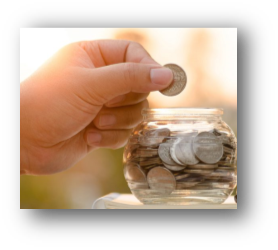 Your emergency fund, when it’s there, has a tendency to keep emergencies away. When it’s not there, a lack of it tends to attract emergencies. It’s wise to have approximately six months’ worth of income in a rainy day fund, and more experts are now recommending that you build up nine months to a year. What changes is the amount of your monthly expenses that will be consumed if you need to tap into the fund. If your mortgage, tax, insurance, utilities and other payments rise with a new mortgage, you could use your savings up more quickly. With this in mind, if you were saving less than the guideline, intending to tighten your belt, the increased bills that come with home ownership makes skimping on your rainy day fund a dangerous business. Then a few weeks after you’ve gotten those golden keys, your car breaks down and you have to purchase a new one. Or your spouse ends up in the hospital. Or you lose your job. You have no means to pay for the medical bills. You can’t afford to get your car repaired, much less replaced. And how are you going to look for another job without a car? Yes, these are worst-case scenarios, but they do happen. It is never a good idea to leave yourself so vulnerable, even in the name of buying a house. With all your money tied into your home, and next to no equity to borrow against, you won’t have access to any liquid funds. What could have been a small financial setback can turn into a financial nightmare that takes years to bounce back from. Previous: Previous post: Down Payment..
Next: Next post: Does Pre-Approval Guarantee a Loan..?